When Kakugen was preaching throughout the land, the ashes of the Buddha held at Enkaku Temple were divided, and Kakugen carried them on his back. After his death, they were placed here. The beautiful reliquary can change its shape due to the support of the square roof on a circular shaft, and although it is small, it is elaborately constructed right down to the smallest part. The roof has a finial atop it. 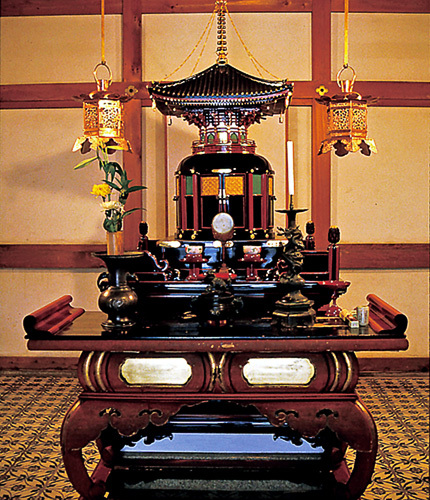 The arrangement includes a yotesaki design which is normally seen in double-storey Buddhist towers, with a beautiful openwork pattern used on the door of the shaft. The koran columns used on the base are marvelous. The teeth of the priest Kakugen are also interred here. The Zen priest Kakugen founded this temple in the 11th year of the Shohei Era. Kakugen was a member of the famous Chiba family from Shimousa, and became a famous priest from Enkaku Temple in Kamakura. With the assistance of Tokiyori Tada, who was the Governor of the Minokuni at the time, Kakugen opened the Zenzo Temple in Ibigun and Chozo Temple here. Finally, he returned to Chozo Temple and died in peace at the age of 83. 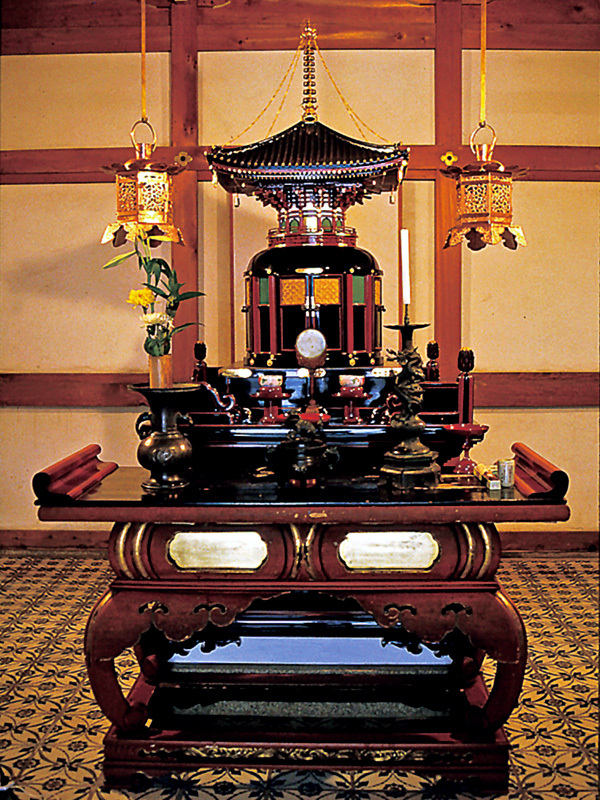 The dais for the Buddhist statue, which was repaired in the Genroku Era, is a beautiful and marvelous object.